Turnips are a brassica root crop commonly used as a fast-maturing single-graze crop to bridge a summer feed gap and maintain milk production. reduce the amount of surplus pasture needing conservation in the spring, thereby improving pasture quality and production. There are two varieties of bulb turnips: the soft white-fleshed bulbs referred to as soft turnips or summer turnips, and the hard, yellow-fleshed bulbs referred to as hard turnips or sometimes described as winter turnips. Which turnip type should I plant? The higher-yielding, faster maturing soft, white fleshed turnip varieties (or summer turnips) are more commonly sown in dairy systems and are used for summer feed. This type of bulb turnip offers a high-quality feed to supplement summer pasture and maintain milk production. Testing shows an ME of up to 12-13MJ/kg DM and leaves are a valuable source of protein in summer. Turnips need a minimum of 60-70 days and have no ripening requirements. The proportion of leaf to bulb varies with individual cultivar. Talk to your local seed representatives for cultivar options. The harder types have better bulb-keeping ability but produce lower yields (t DM/ha) than soft turnips. Harder types are an option for single graze winter feed, or for later maturing summer feed. Winter turnips tend to have better tolerance of lighter soil and lower soil fertility. If turnips are required over an extended period (e.g. mid-January to March) sometimes the first two-thirds of crop is soft turnip, and the final third a better-keeping hard turnip. Also called forage brassica, a cross between turnips and other brassicas this is a less common dairy feed. What animal health problems can occur on turnips? Most animal health issues occur in the first day or two of feeding, as animals adjust to the crop. Ideally cows should be fed alternative feeds (e.g. pasture or silage) before accessing the crop to minimise the risks. Milking cows can lose condition when eating turnips if pasture is short. The extra protein in the turnips can lift milk production at the expense of cow condition; this can be corrected by feeding grass or maize silage at 2-3kg DM silage/day. Bloating has been reported in cows grazing turnip crops. Drenching, or grazing cows on turnips after they have eaten some grass are ways to overcome this. Rumen acidosis can occur if turnips are introduced too rapidly. Introduce them slowly over 5-7 days to allow rumen microbe populations to adjust. In some years, on some farms, photosensitivity can be seen in stock due to the glucosinolates in turnips. Remove affected animals from the crop and give shade, good quality feed and water. Which pests, diseases should I look out for? The main disease threats are club root and dry rot; while the main insect pests are springtails, leaf miner, diamondback moth, white butterfly, aphids, and when direct-drilling, slugs. Inspect young crops regularly by walking well into the paddock and, if necessary, apply the appropriate insecticide. If the pest burden in your turnips is especially high, you may want to consider planting chicory instead. Chicory has fewer issues with pests, particularly diamondback moth and cabbage white butterfly. What do I need to consider when deciding to grow summer turnips? good management of subsequent new pastures. Turnips performs best in areas with milder summer. Turnips can have pest issues; where pest and disease pressures are high, chicory may be a better option. *Protein % for turnips can vary greatly. Up to 20% crude protein has been recorded in some cases. 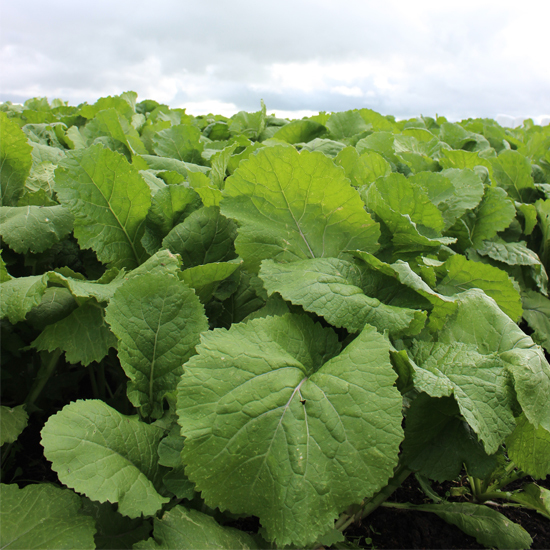 Turnip crops can yield over 15t DM/ha. Given summer turnips are usually grown in summer dry areas, a more typical yield to work on is 11.5t DM/ha. In dry seasons turnip crops may only yield 7-8t DM/ha. Turnips used for winter feed in southern regions generally have lower yields. Turnip crop yield varies greatly depending on crop management, environment conditions and sowing date. Research has shown that October sowings consistently give high yields than November sowings. Leaf yield reaches a maximum at 90 days after sowing, whereas bulb yield continues to increase until 120 days after sowing. Turnips cultivars are classified based on a “typical days to grazing” basis, with most cultivars needing around 60-100 days to mature. In cooler conditions growth and maturity is slower. Early maturing types take between 60-90 days to mature and are those most commonly grown for summer grazing to boost milk solid production. Medium maturity types take between 80-100 days, and late maturing types can take up between 90-100 days to reach grazing maturity. Late maturing cultivars have better frost tolerance and winter keeping properties than the early maturing types. Testing shows the ME can be as high as 12-13MJ/kg DM, and the leaves are a valuable source of protein during the summer. Protein percentage in turnips can vary greatly from 12-18% DM. Milk production responses to feeding turnips varies with each situation. Trials on commercial farms have shown responses of 42g MS/kg DM crop over the summer and autumn. A three-year short-term feeding trial showed that feeding 4kg DM/cow of turnips in addition to 10kg DM pasture/cow daily in the summer and autumn significantly increased milksolids production by 24% (45g MS/kg DM crop) compared to feeding 12kg DM pasture/cow. The information presented here only gives an indication of the likely effect on immediate milksolids production and does not include potential carry over effects. Like all supplementary feeds, introduce cows gradually to your turnip crop. It is recommended you offer a maximum of 2kg DM/cow in the first five days, and increase feeding level gradually over the next five days, up to 5kg DM/cow/day. Turnips should make up no more than a third of cow diet to minimise potential milk taint. Turnips should make up no more than a third of daily ration. With good management, up to 90% utilisation can be achieved. For summer turnips, begin grazing early maturing varieties around 70 days from spring sowing. Later maturing varieties, such as Green Globe, should be ready to graze from 100 days, and can be used making up the final one third of a summer crop. The area used to grow turnips depends on why turnips are being grown. The emphasis in growing a summer crop of turnips on dairy farms is to achieve a high yielding crop (12-14) tonnes DM/ha, or greater. Plant 2.5 ha per 100 cows to get enough turnips for 60 days feeding. With a crop yield of 12t DM/ha and 80% utilisation, this will allow 5kg DM/cow/day offered. Turnips can be sown from spring through to late summer, autumn or winter depending on the cultivar. Turnips on dairy farms are commonly used as a summer crop to fill a feed deficit. Turnips perform best in areas with milder summer. Critical for a good yield is sowing early while there is good moisture available. Plant the crop well before conditions get dry. Turnips are sensitive to moisture stress especially at establishment. Turnips should be sown 70 days before they are needed to get maximum feed quality. The sowing period for turnips starts in spring (typically October) for summer production and extends through until February or even March in warmer areas for winter production. The seed can be sown by broadcasting or drilling. Drilling equipment will distribute the seed more evenly, but still requires rolling after sowing. With broadcasting, it is generally suggested to sow twice at half the sowing rate, with the second pass in between the wheel tracks of the first, to get a more even crop. Turnip seeds are very small, and need a fine compact, clod-free seedbed to germinate and establish well. Cultivate paddocks well to a fine tilth. Where soil type and moisture is appropriate, it is recommended to roll the paddock twice before sowing, and once more after sowing, to ensure the seeds have good soil contact. Turnips can also be established using no-tillage techniques; to be successful, pest control is critical, and it is important drill fertiliser with the seed, and apply extra nitrogen to make up for the soil having less available nitrogen. Whatever method you use, do not sow deeper than 1-2 cm. While not essential, lime or sand can be used as a carrier to spread the seed more accurately if the sowing rate is low. Nitrogen or potash fertilisers must not be used as a carrier, as they cause seed burning, which reduces germination. Typical sowing rates are 0.5 to 1.0kg/ha if drilled, and 2-3 kg/ha if broadcasted. Use treated seed protect against springtails and damping-off diseases. Soil tests should be carried out on paddocks where turnips will be sown and if required, capital fertiliser and lime should be applied the season prior to sowing. The ideal pH is 6.0 to 6.2. Crops grown in high fertility will have less weed and pest problems. Apply your normal spring fertiliser dressing, and prior to sowing, apply the fertiliser required to grow the crop. Boron should be applied at 3-4kg/ha. Three to four weeks after emergence, apply 75kg N/ha; this ideally done before bulb formation. Perennial weeds cannot be controlled once the turnip crop is sown, as there are no herbicides that can do this economically. Perennial weed control can be achieved through a planned approach beginning with an autumn spray, followed by a winter ryegrass crop, and then the turnip crop. Some selective herbicides can be used to control germinating annual weeds in turnip crops. Ensure the correct rate is applied to prevent residual damage in new pasture following the turnips. Use the AgPest website to help identify and manage plant and weed pests on-farm.